Wandering around the streamside reserve on the King Parrot Creek at Coonans Bridge, Flowerdale the other day, we came across the usual array of small birds – Red-browed Finches, Grey Fantails, Eastern Yellow Robins, thornbills, pardalotes and honeyeaters – flitting through the dense vegetation. But the most abundant bird at present seems to be the Silvereye, whose constant testy-sounding contact call dominates the small bird chorus – click on the audio arrow below to hear. Each year at about this time, numbers of Silvereyes in Victoria are boosted by an exodus of birds from Tasmania moving north for winter. 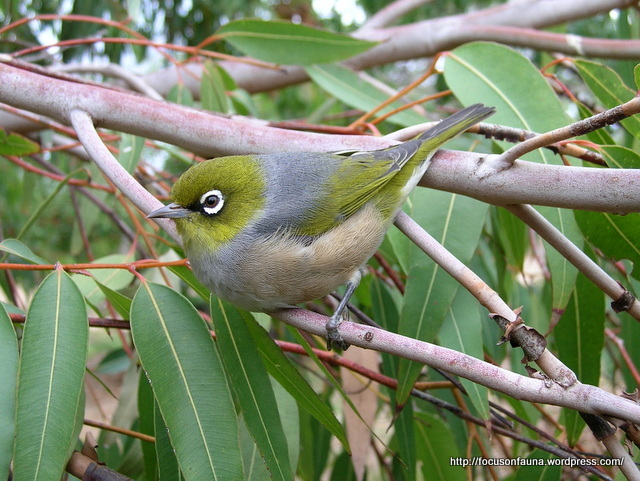 There are several subspecies of Silvereye – the birds of the Tasmanian subspecies can be distinguished by a rufous wash on their flanks. The colouring of the Silvereye’s plumage is nuanced (click on the photo for a closer look), often blending with the foliage of shrubbery in which it forages, making it surprisingly hard to see, though its call is a give-away. There is no shortage of food for Silvereyes in the reserve. 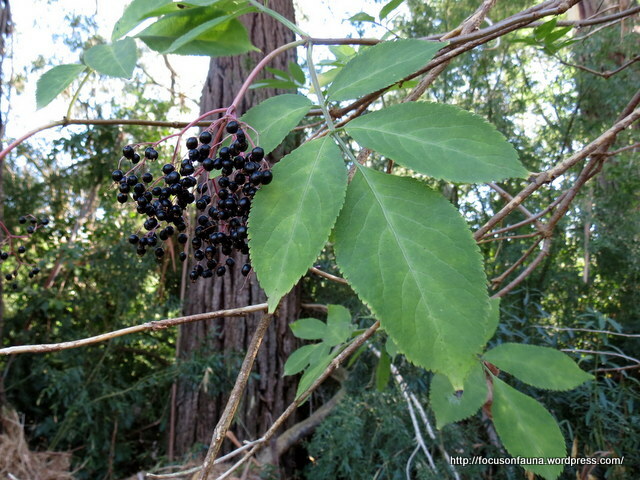 Apart from numerous insects, there are the berries from Tree Violet (Melicytus dentatus) and Prickly Currant Bush (Coprosma quadrifidus) as well as the increasingly prevalent introduced weed Common Elder (Sambucus nigra). Blackberries (Rubus spp.) are present, but in greatly reduced numbers due to ongoing control by Landcare members and the Goulburn Broken Catchment Management Authority. Following the recent Platypus Watch organised by the Strath Creek Landcare Group and King Parrot Creek Environment Group (click HERE for a report on the event), some participants went on a spotlight walk through the reserve and were rewarded with a sighting of a Common Ringtail Possum, as well as close up views of birds roosting in the shrubbery, particularly Silvereyes, whose white eye-rings shone out as the birds froze in the spotlight. 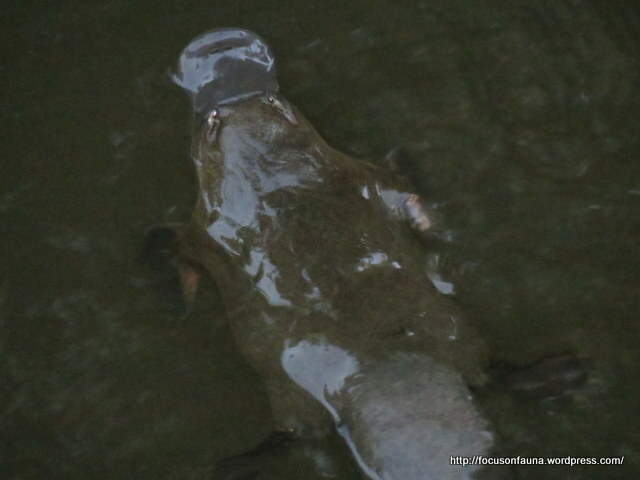 A couple of days later, we returned to where the only platypus was seen and were able to get a clear photo and very brief video of this sleek animal. Funny, we have all these divine little birds you mentioned at our place , but never seen a Silvereye here, wonder why? That is a bit strange, Di, that you haven’t come across them. 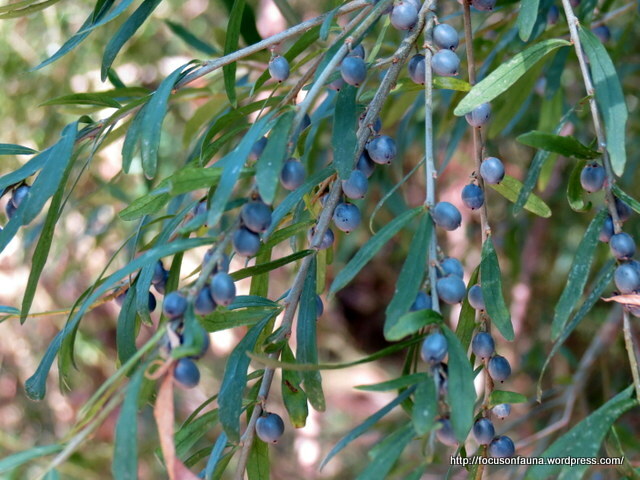 They are quite gregarious and seem to like fairly thick, sheltered and connected vegetation and are constantly on the move from shrub to shrub as they feed.They are common in orchards and vineyards and sometimes considered pests. We have added audio of the call since your comment (had some trouble uploading it initially), so it might be worth another look at the post.